"We opened Qalam school to give our children hope; an education and much more; to give them a better, cleaner and caring environment; to teach them how to take good care of themselves. We attend to their personal hygiene (they take baths at school if needed). They are taught how to eat properly, behave appropriately, use words like ‘please’ and ‘thank you’, and to share. Simply, we try to help them be good human beings. They are taught how to read, write and express themselves and English and Urdu. They are taught English, Urdu, math, general sciences (physics, chemistry and biology), social studies, religious studies (mandated by the State), basic computer skills and applications, and arts. We have come a long way from our inception in 2010 with a few elementary grades to the matriculation level. In 2018 year our ninth grade took their Board Exams and in 2019 our first matriculation (10th) class will graduate from the school! For recreation our students play football, cricket, board games as well as spend time in the library reading books. Due to a lack of basic education and unavailability of tools that promote and develop a creative mind, we found that they came to us with somewhat of a ‘narrow vision’ (thankfully they had limited exposure to TV and internet). We therefore try to bring out their creativity and help them develop their imagination. We regularly engage them in artwork, which includes coloring, pasting, cutting, drawing, coloring and making things with simple items. The children are also taught how to look after their health. They have annual well-being physical, vision and dental exams by a volunteer pediatrician, ophthalmologist and dentist. They are given toothbrushes, toothpaste and vitamins”. Our children came to us from homes where the parents were not educated. Typically, they would leave their children at home and look for manual labor to earn menial wages. Their children would roam around . 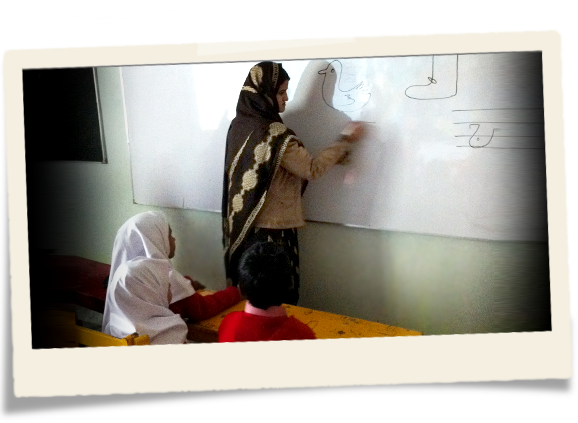 . .
Students at The Qalam School are taught how to read, write and express themselves in English and Urdu. They are taught Math, basic concepts of science, social studies, and general knowledge. Their education also includes . . . The Qalam School is situated in the outskirts of a small subdivision of Rawalpindi known as Gulistan Colony, behind the famous Ayub Park, off the Grand Trunk road. This area was chosen due to the presence of shack-type dwellings . . . The Friends of Qalam School, Incorporated is a 501(c)(3) nonprofit organization (Tax ID # 45-4910908). All cash and in-kind donations are tax deductible. The corporation utilizes 100% of its donations to support Qalam School, Rawalpindi, Pakistan. Copyright 2011 The Qalam School. All rights reserved.